It’s been a pleasure working with Scott from The Five Day Startup! He’s the very best at what he does! I’m a new entrepreneur and had no idea where to start. In my initial consultation, he helped me sort out my ideas and get the ball rolling. And he did an amazing job on my business website - I love it! Now I’m in business, just like that! Will definitely hire again for future services. Click here to explore my website. I went to The Five Day Startup because I needed help with clients not showing up to appointments. I had a 25% no-show rate and could not manage to call each client to remind them. After working with Scott, he explained that there were simple ways to automate reminders and even told me I could have a website with online bookings and automatic reminders! Since starting with The Five Day Startup, my no-show rate is down 98%. Not to mention my site has brought in new clients I was not expecting. The Five Day Startup managed to go above and beyond my expectations. They provide tremendous value and are now my go to with any business needs! Where do I start? I began working with Scott before The Five Day Startup even existed. He helped me create my first online retail product from the ground up! He fully managed the manufacturing and development of my crucial product Rave Doctor, helped grow my social media to over 85,000 in one year and managed all our Amazon sales. He was able to rank us on the first page of Amazon and earned the Amazon’s Choice award. Once The Five Day Startup was founded, we used Scott’s team to completely recreate our website increasing conversion by 40% and website speed by 83%. If you are currently running a business or just getting started look no farther then The Five Day Startup! I came to The Five Day Startup only knowing I wanted to start my own business. They were able to help me find a product, manufacture it, import it to the US, create my website, develop automated fulfillment worldwide, and rank me on the first page of Amazon and eBay! I currently use them on the back end of my Instagram and could not be happier. 10,000 followers in under four months. I do not know how they do everything, but it is my one stop shop when starting a business! My experience with The Five Day Startup started with Scott. We worked together early in our careers. One day he mentioned this “must read book” and from then on I have been a full-fledged entrepreneur! I now partner with The Five Day Startup in my newest business. They helped me grow my Instagram from zero to 5,000 in only two months. The value behind this is Amazing, as we target a small group of people based out of Michigan for our service launch. Scott has been a critical part in helping me get started and has become a lifelong friend. Check out my Instagram and follow me. Working with Scott has been my secret weapon for the last couple years. He has helped me with everything from business etiquette, marketing strategy, and pitch deck reviews. Most recently he helped me with a cosmetic brand I am developing. His ability to run analytics and give critical feedback helped prepare me for my pitch. I will be partnering with The Five Day Startup on my next venture to helping implement a go to market plan! I can not wait to see what we can do together! Click here to see Brie's article. This book was concise and, more importantly, very helpful. A lot of these types of books are unnecessarily long but this book got immediately to the point, which is appreciated considering my busy schedule. I'm considering quitting my regular job soon to start up my own business and I feel much more confident doing so after reading this book. I even got a few extra copies for my friends who are considering the same path. For any new aspiring entrepreneur this is like a quick start guide on how to free yourself and create new revenue streams quick and easy! 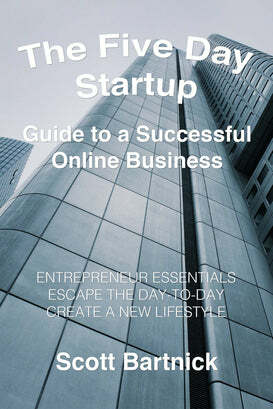 I would recommend this book to any new entrepreneurs who are looking for a place to start. It is easy to follow and provides great insight into the world of online sales. The information is up-to-date and relevant with today being ruled by online companies such as Amazon and Google. It is clear that Scott (the author) is sharing some of the knowledge he has learned along in his journey, too. This was one particular thing I enjoyed. You felt like he was not talking to you as a mentor but as a business partner who wanted to share his experience. Just know, this book is not intended to be a college course in business and sales. It is intended to be a manual that provides you with a foundation on which to build. And, it does just that. The Guide to a Successful Online Business has changed the way I run my business! A friend recommended the book as a fast but detailed read. It did not let me down! I cannot wait to see what else The Five Day Startup comes out with. They do a great job of listing resources I've never heard of! After reading the book I set up my first VA and my life has never been easier! I love The Five Day Startup. I was researching a new business idea and gave Scott a call. He recommended his book. I am so glad I got it because it defined step by step what I needed to do to start my business and insures I would be sucsefule! I am now working with The Five Day Startup team to develop my first website. I will update my review after it is complete.